Matt, Can you explain this art. I’m afraid I have a different interpretation of this. In my perspective, you like to express your feeling towards art. Its like you want to show to others that you are happy by using of the brilliant colors but the symbols itself you are hiding a great fear of the circumstances in the near future. It looks like pyramids. Very interesting “art”, I guess it could be considered. The repetitious words are interesting, also. You are right about the fact that these symbols are used by freemasons. Your second claim is a claim of whom I wonder if you can offer any evidence. Although freemasons, rosicrucians and sufis are all gnostic forms of religion, their basic principles are not in accordance with the basic principles of what you are talking about. There is an overlap between Christianity and Gnosticism because certain same elements of both religions are emphasizing the objectives of these religions. Concerning Judaism and Islam we can say that these religions are completely different and more concerned about rules, Christianity and Gnosticism are emphasizing the idea of connection between people and the importance of love in our lives. The main difference is the concept of God which is different, although the objectives of all religions seem to be the same, they just have a different expression. Although claims of conspiracy theorists are interesting and worth researching, it’s quite difficult to find evidence and except for some rare cases, most conspiracy theories don’t have a very good foundation. Looks like an eye on the larger pyramid; interesting that there’s the word “men” written backwards; the eye reminds me of (I think it’s the logo for channel 3). The artist has a lot of deep thoughts he/she is expressing-tough to know where I should focus my attention-very busy! Also very thought-provoking! There’s a “$” & “TLC” written under it. Could it be the artist’s intention is to convey “Tender Loving Care”? What is the meaning of the dollar sign, & what does it have to do with love/someone loving one’s own or someone else’s art? A lot of mystery involved-difficult to know how to interpret this. Maybe the artist’s intention was for his/her art to be vague & even secretive. There’s a zig zag under the large pyramid. I wonder what they were trying to say! I wonder if it’s intended as art or graffiti, since at times words are repetitively used in graffiti. Love the vibrancy of this street art/ graffiti. Lol bout the pole but yeah, the illuminati association gives me the creeps. Lovin that font toooo! ❤ smart choice of colors as well! Timelessness, the ancient dressed-up in the new approach. Reblogged this on răsfăţ cultural. Hi Mat, to me it looks like a mixture of pyramid, Mayan and some form of Graffiti. Utterly fascinating. The text on the left is a conglomeration of she love, loves me not, they love. Then there is a deterioration of the text as it moves down. The symbols are all ancient but modern. It’s author signs to the left “my art” leaving one to think the true meanings are left to himself. like a puzzle and the pole makes more convenient to the eye. Regards. Reblogged this on Riezka Fruit Chibi. That must be some shady form of freemasonry, I just can’t find any other reasonable explanation. Reminds me of “he loves me, he loves me not”. The word “time” written inside the eye may be representing someone looking at a watch/calendar. It might be someone reflecting upon time. The eye with the word “time” written inside it might be representative of someone reflecting on time, perhaps someone reflecting on time that’s gone by. The artist sure likes triangles/pyramids! To some degree, this “art” reminds me of someone who was doodling. (Kind of like a very elaborate doodle)! Some of this look like clouds, I just noticed. Reblogged this on ভালবাসার রঙ. This could be interpreted as poetry. Maybe this is time reflected on/interpreted in a positive & optimistic way, since the little white spots remind me of a clear, sunny day, so perhaps the artist/poet has a sunny outlook on life/their past, present, & future. Looking forward to things & not dreading or feeling afraid of the future. The “poetry” & its repitious words of love might be symbolic of romantic love; of love that the 1 experiencing it/perhaps having love in his/heart also, may be an expression of happiness/joy/absolute bliss that the person they love also loves them; &/or someone happy/joyful/accepting of themselves which results in love for themselves. Perhaps they are joyful that the person they love loves their art also! Perhaps this is a tribute to the person with whom this artist/poet is in love! The use of bright colors may be an expression on the artist’s part. Very cheerful! *the use of bright colors may be an expression of the artist’s happiness. Perhaps the “$” is a way the artist is expressing that they feel rich, even if he/she isn’t monetarily so, because they’re happy with themselves/their life in general/the person with whom they are in love, & they feel genuine & authentic love from that person. They may feel cared about & cherished/adored for who they are, & the object of their love doesn’t desire to change their personality or anything else about them! Also, perhaps they accept the object of their love for whom he/she is, so it may be mutual which is a very beautiful & precious thing! He/she may be expressing ecstatic happiness about 1/more aspects of their life! Reblogged this on novelists . Reblogged this on Walking Dot. Hey mate, just wondering do one of the triangles have a eye shape in the middle or is it just me? All these comments are fascinating. Oddly, this reminds me of a story I posted on my site where ancient Egyptian guinea pigs try to take over the world. Weird. I guess I’m artistic and stuff. She loves me, she loves me not. I tend to look at the use of backward letters as a past issue, past tense….sort of thing. That’s how it works in my life. I like it. Reblogueó esto en Luis Herrera . WoW” It’s certainly caused a stir here on WordPress! curious thing street art, sometimes they don’t have to mean anything but pure fun. I think this is very nice art. 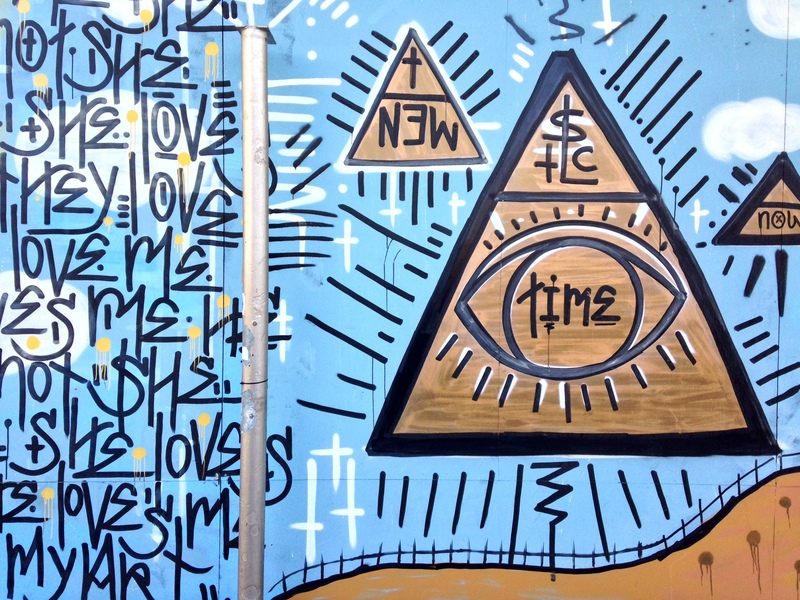 I very much like the composition of this art and the symbols which are used, which are indeed illuminati symbols, which makes it more interesting to use them if they are properly used.